Ink-a-Doodle Creations: Todays the Day!! Holiday Mini Catalog is HERE!! Todays the Day!! Holiday Mini Catalog is HERE!! Good morning everyone! I'm so excited to be writing this post this morning and bringing everyone good, no, great and exciting news!!! Today is the Day....today is the release date of the new Stampin' Up! 2014 Holiday Mini Catalog! WHOOP WHOOP!! 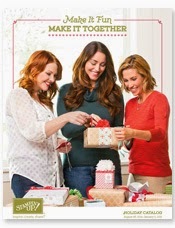 This catalog is full of exciting new products to help you with all sorts of upcoming holiday projects. From new Halloween DSP and stamp sets, to Fall DSP and stamp sets to Christmas/Holiday/Winter DSP and stamp sets. Bling and ribbons, oh WOW, you just need to go take a look for yourself! If you would like to have your own paper copy, please leave a comment with your name and address or send me an email. I will be happy to send you one!